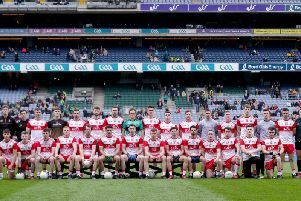 Derry’s Division Two hopes have been dealt a major blow after it was confirmed Mark Lynch has been ruled out for six weeks with a knee injury. The Banagher forward suffered bruising to his ligaments towards the end of last week’s draw with Clare and Oak Leaf assistant manager Brian McGuckin revealed his absence is a blow. It is a huge blow because he’s done serious work to get himself prepared for the start of the league. It is disappointing for Mark more than anything. “Mark hurt his knee and it looks like he will be out for up to six weeks which is very disappointing,” revealed McGuckin. “It is a huge blow because he’s done serious work to get himself prepared for the start of the league. It is disappointing for Mark more than anything. I am well aware of the amount of work he has put in to get fit. “It is frustrating but again it could have been worse. It was very near the end of the game. There is bruising on a ligament and we have been told it will be about six weeks before he is back. The injury means Lynch will miss this weekend’s clash with Meath and potentially further games against Kildare, Down and Galway. It also means Glen forward Danny Tallon will have a chance against Meath to stake a claim for a prolonged run in the Derry attack. “Obviously we are working with a very young squad but we have the Glen players available to us again so it is an opportunity for Danny Tallon to come in and show what he can do at this level,” added McGuckin. “Mark’s experience will be a big loss. Danny has all the talent in the world but obviously lack a bit of experience at this level but it’s a chance for him to get bed in and earn that experience. He is a player who we would like to think will have a very positive input as the year goes on.